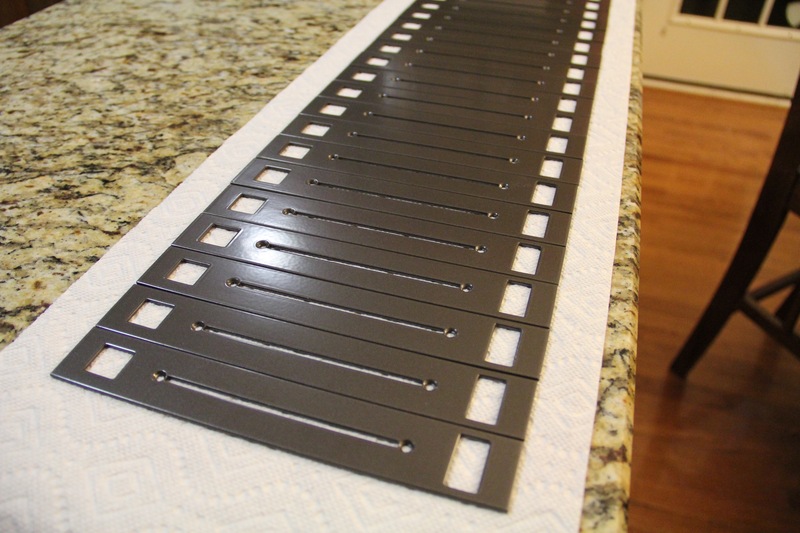 Redoing the powder coating on the fader plates needed done. They were pretty ugly and abused. I knew I was going to have to deal with getting the artwork back on them if did this. The options for that being, I could re-screen print them like they were originally, or the higher tech way of having them laser engraved, which really just burns the powder coating off and exposes the aluminium underneath. Either way, I had to recreate the artwork, matching the original artwork as close as possible. So, I started there. I put the "nicest" looking of the original fader plates on a scanner and made a really high res scan Obviously,I did this before I sent them all off to get powder coated. I also scanned the track ball plate too, since I wanted to put some graphics on that plate as well. I dropped these images in Adobe Illustrator and created artwork that matched as close as I could, the original art on the scan. Here is the finished artwork I used for the plates. Anyone who wants this art file, just let me know. All the plates came back from powder coating.... I wasn't exactly thrilled with the quality of the job they did. This shop usually does large parts like ATM machines and industrial parts, not smaller parts like these. There was some buildup on the edges and the color was a little too shiney. I lived with it. It was still a vast improvement over what they looked like originally after 25 years of use and abuse. 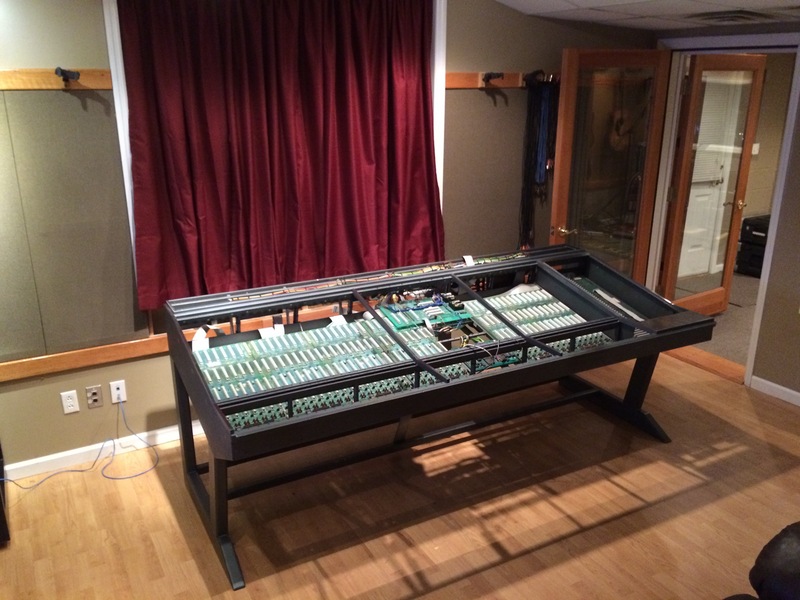 Finally got to the point where I could decommission the old console in the studio, an Amek Einstein Super E 40. I loved the Einstein... I had done a similar process on it a few years back. I felt stressed with the risk of swapping it for this "project Mozart", hoping it would at least end up sounding as good as the Einstein did. I had some strong friends come and help me move the console frame from the garage down to the studio, which is in the basement. I wasn't finished the the recapping at this point. My very gracious friend Bret Teegarden came and helped for hours putting in new caps. That process continued in my garage for a few nights a week for a few months. 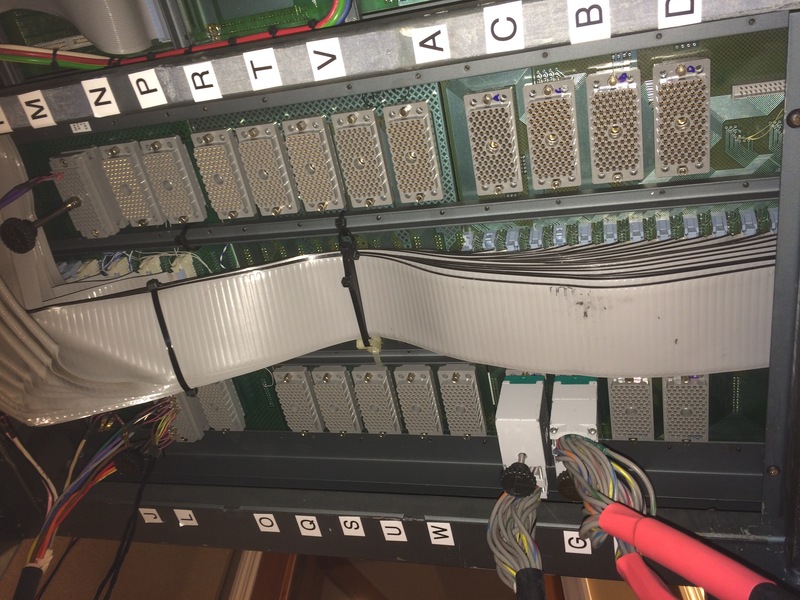 Time scale of this project got lost at this point...... finished the power supply hook up, and most of modules recapped... testing the multi-track Bus/Tape connections, and trying to figure out how to align the bus outputs and tape returns..... figuring it out as I go. There is closet seen in the top photo, that is where the console power supply, all the audio interfaces, and the Mac Pro are housed. It is "climate controlled" so that the heat is vented via A/C and monitored with a thermostat and alarm. Close the door, and the sound of all those fans in the control room are GONE!!!!! Awesome. Yes, I know, but, it is a home studio after all. The motherboards for the patchbay and ELCO connectors where all full of cracks and broken traces. Bad thing for a multi-layer PC board. I wasn't the first one in here making these jumps, but I made the most by far.... More abuse, translating into more unanticipated time in repairs. Below, photos of the patch bay mother boards, on bench , testing the traces and jumping the bad ones. Then testing it again,... and finding more broken traces, repeat, repeat, time sucking hole.... I ended up jumping a lot of traces but finally got it all working reliably. Look close and you can see a bunch of my jumps... 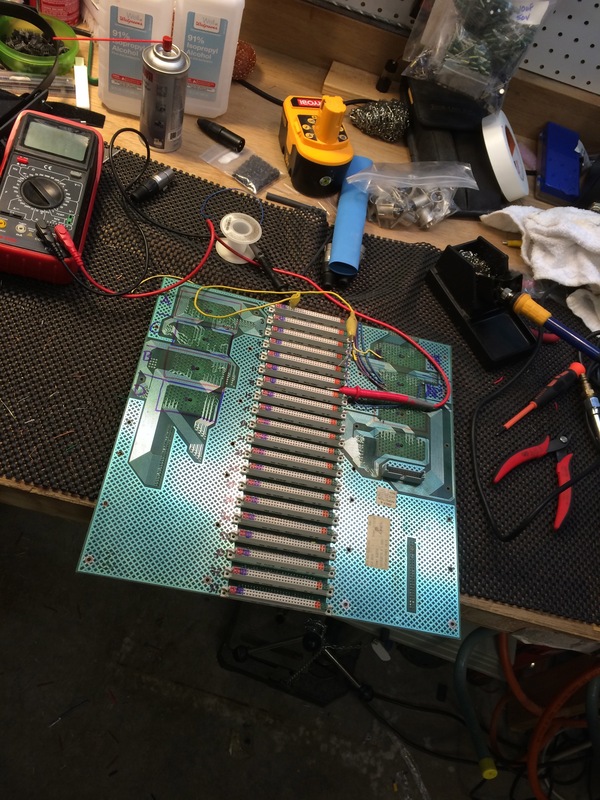 I started on the master section, and worked my way down through the channel motherboard. I made a wood shelf and mounted it to the top of the meter bridge with bolts. It gives a wider footprint for the near field speakers and a sturdy construction to attach the computer monitors mounting bracket, without having to alter the back of the console to make all this work. The computer monitors are 4 23" LG IPS Displays on one Mac Pro. Looks like at this point I have aligned 1k tones for all 40 channels. The Amek trackball and Amek keyboard are converted and wired as a USB keyboard and mouse for the mac, despite the wireless keyboard and apple track pad sitting there... They are connected to an CAT5 USB 2.0 extender, which is also connected to the previously mentioned USB card reader/hub that is installed in the old floppy slot. It is really handy to have fast USB 2.0 connectivity right on the console. No doubt at this point there are also a load of little problems like bad switches and pots, and distorted/bad opamps at some stage in the channel paths... all still needing to get sorted out- one problem at a time. There were also a zillion intermittened/scratchy bus switches..... Dave Rochester's Tefrawn was very very handy here, but still getting them all to work reliably was a huge amount of time. 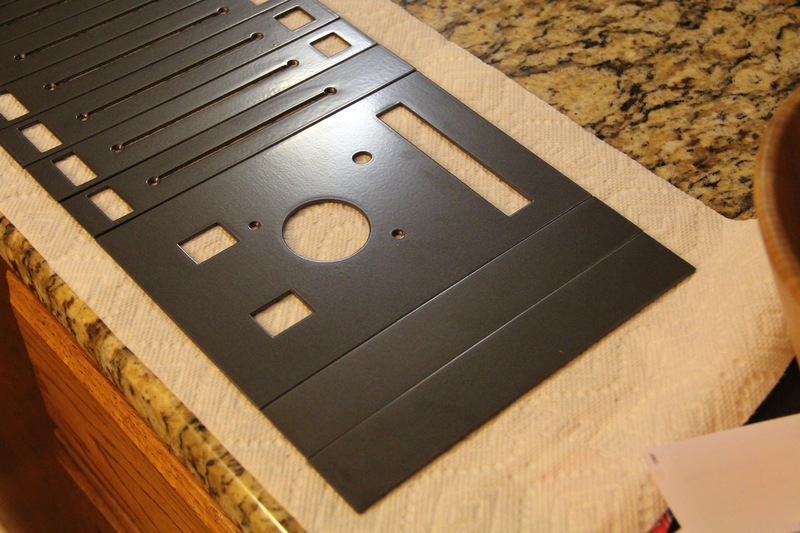 Also, the fader plates are not done at this point yet. I elected to have the fader plates laser engraved instead of getting them screen printed. 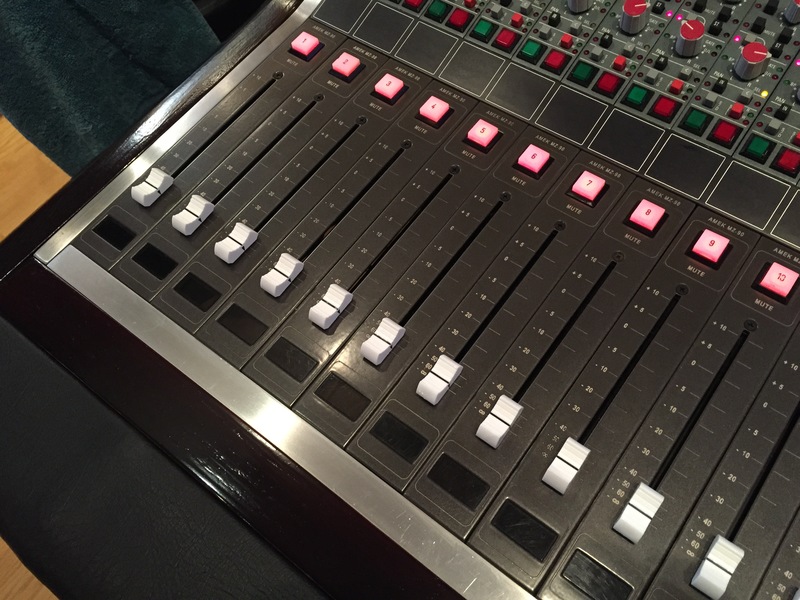 I chose this mainly because I always use the typical sharpie and console tape on the faders when mixing. Most of that screen printing ink will soften and wipe off with alcohol, despite what they say, even the epoxy inks. I use the alcohol to clean the sharpie marks off and I didn't want the numbers to disappear over time, like the factory ones did. I don't regret the decision, even though the screen printing would probably have looked nicer, at least at first. The laser engraving was also quite a bit cheaper and faster. Not perfect, but pretty good, and very durable. I started this project with no "Mozart" experience, but I had plenty of other "Amek console" experience. I am not an expert at technical work. But, I have learned a lot, and improved in my techniques and understanding through this project. For those interested, almost all of the critical parts are still available new from Audio Maintenance Limited (AML). Things that they don't have, you can sub pretty easily. The only parts I know of, that are really hard to find are .... The custom Amek meter driver chips, the SSM2016 Mic Pre chips, and the Pan Pots used in the RN Modules. And even these are still obtainable, but you will have to perform some work to find them. Overall, a pretty great console, well made, and seems solid now that it is finished. Channel path and routing takes a bit of getting used to at first, as most console do. This console was pretty well abused before I got it, and I did not anticipate the level of work it did take to overcome all of the issues. Even after the thousands of hours, I don't regret the decision to swap my Einstein for this Mozart. During all of this, I scheduled a session, that ended up falling on a day that I would have hoped the console would have been further along than it was at. It was an under-estimation of the amount of time it was taking to get this thing ready for a session. At that time, I had sorted out the patchbay, and had enough modules recapped to do this session with a few spare ones, or so I thought. Turns out, I barely had enough good modules to get through it. This session was a basic tracks session, drums, bass, keys, and vocals, about 18 channels. With the problems, I ended up... just shifting input channels down and skipping the bad ones as I found them. I stressed a little getting through that session. And, I did spent time after takes, checking tracks back, making sure the recording was clean. All ended up fine, and no retakes were required due to technical issues... Luckily. I ended up fixing "issues" while I was mixing the project. Luckily it was not a time sensitive project... It certainly caused a delay. My client knew where I was with the console. The "beta testing" aspect of the console and the time delay of project delivery was not an problem for this client. That project ended up sounding fine despite the issues. I have since done other sessions, and am pretty confident that console is ready to go. No known issues at this point. I even have a few spare modules ready to swap in just in case of problems. I can say that it does sound more "expensive" than the Einstein did, but in a minor way. The Einstein sounded great to me to. The Mozart has better control of the "silky" part of the top end, via better EQ controls. I EQ in the DAW mostly, and was pleased with the EQ's on both the regular and RN modules, for different reasons. Overall, the Neve modules sound better to me than the standard Langley modules do, but each is valuable in their own way. Both are great sounding modules. Does it sound like a SSL... nope, It that a bad thing? Not at all. In some ways it sounds better than an SSL. 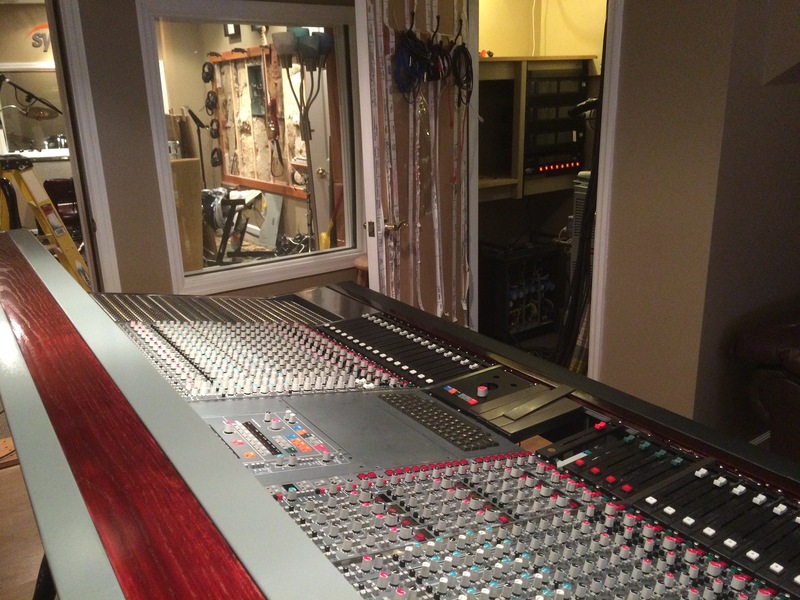 It sounds warm and big, and typically SSL do not sound warm (some say brittle, I think that is an exaggeration). Also, SSLs can be noisy when not using an ideal gain structure on tracks. So, in those ways this console is better than an SSL . All of this is subjective and may or may not be a good thing, depending on what kind of sound you are after in your production. Does it sound like a Neve? Well, it to me sounds more like a V- Series Neve, than an SSL, especially on the Mozart's RN Modules. Again, Neve V series have a great sound too. Big and fat, too. For the record, I like SSLs. I worked on a 4000/6000 series at a label for years. 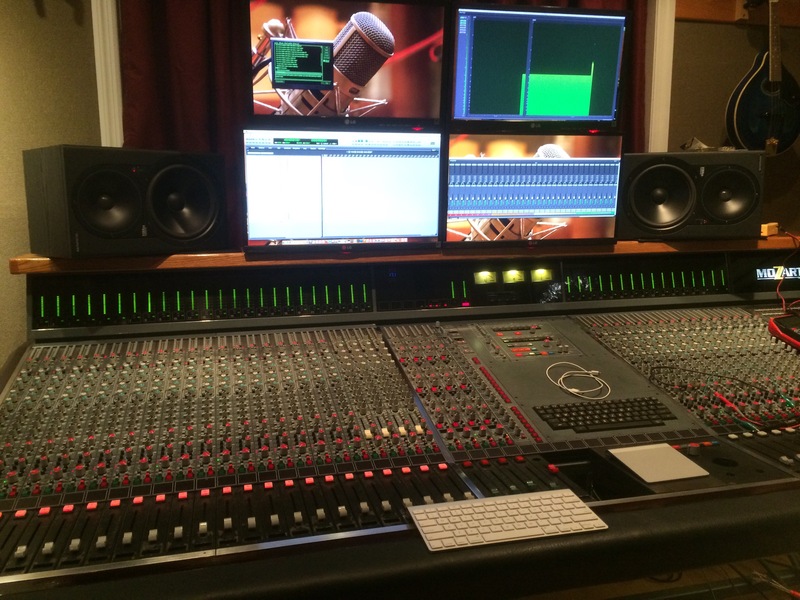 I have worked on various Neves, Euphonixs, MCI's, Tridents, etc.. , and various other consoles in many different studios. I have mixed in the box, out of the box, from 2" 24 track, from Radar, from Protools, from Protools through various consoles..., with really great outboard gear and/or plugins, and have also worked on some not so great gear... as we ALL have at some point. I have worked on every kind of music at one point or another. I have a good basis for comparison. 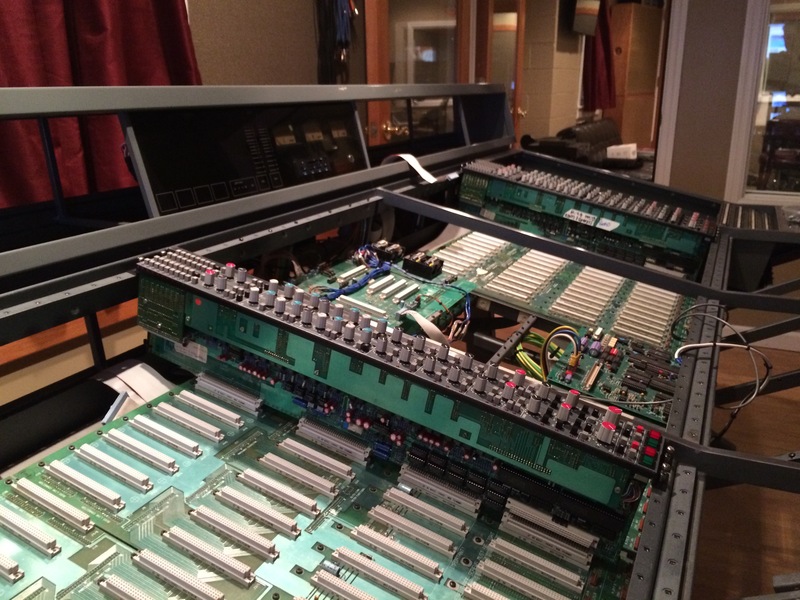 Dave Rochester did extensive testing on this console with his Audio Precision analyzer. After we finished a few modules and the center section recap, mods, and test and restest chip swaps from the original OpAmps, we had a signal that measured flat within .25 db from 20hz to 120khz (yes 120khz), with a distortion spec around .0003 percent. The path measured was a channel tape returns through the stereo bus and out the master bus, frequency sweep. That is as clean as any serious analog console you can find. For raw specs, it certainly beats any SSL out there. I am pretty sure that it has better specs than Protools HD does, and protools is considered THE standard production tool for music. So, do specs really that mean anything beyond a certain point? For this Mozart, many of the critical audio path chips were swapped for more modern ones. Did that account for anything? It probably did, for the increased presence I perceive over the Einstein it replaced, and it certainly improved the distortion and noise specs. We verified that by swapping back the original chips during testing them. It helped in finding what we thought were the best choices for chip swaps. Power supply and cost per chip were also factors in those decisions. Among the mods I have made to this console, one major one was a complete hardwire bypass of the VCAs used in the automation of this console. The VCA sub-cards are NOT even in the console anymore. I automate either in the DAW, or with "operator controlled" automation. This console is great for that. The center "automation computer" is still installed, and can give you "snap shot" recall of just about ANY switchable console function from a computer preset. That alone is WAY better then the Einstein, or most consoles for "Manual Automation" control-ability. Amek may have had problems when the initial versions of the Mozart product released... . You can read all about that with a quick google search. Here is a prophecy... I am sure that it will come up again on this forum. Since the initial Mozart product release, Amek has made many revisions to almost every sub-board in this console over the years it was manufactured. Completely different PCB layouts, and components on many of them. Most of my modules are version B, but Amek went up to revision E , including the master section, and updated power supplies. Amek seemed pretty intent on improving the original design. Just take a peek in the tech manual, and see how complicated the schematics are, based on each revision.... you may be swimming. I think it is fair to say that you can't compare an updated Mozart to a initial release Mozart, and certainly not a fair comparison between this one, and the initial released version. Bottom line, at this point, every Mozart (any analog older console) probably sounds different than it originally did, due to age, caps, release version, mods, upgrades, etc.... That also makes it all subjective.... What matters is... can you make great music on it. I know there are plenty of folks that will argue this, and will claim that it's ALL about specs, caps, no caps, op amp choices... but when making music, it all depends on what YOU can do with the gear, and... does that it give you the ability to make the product you want. At this point, I am very glad to be a Mozart owner. Forgot one little tidbit of information about this console that some people might find really cool. I originally bought this console from an ad on craigslist. The seller still had a lot of the original documentation that came from the first install of the console, when it was brand new. 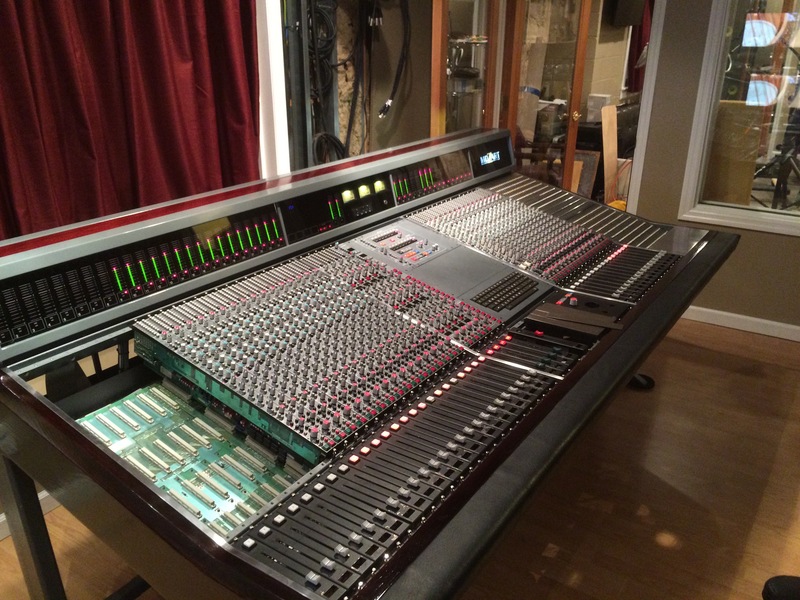 Surprisingly, this original owner of this very console was the Hit Factory in New York City. Purchased in early 1990. I have custom track sheets, session notes, gear documentation, installation notes, and procedure for operation, and other pages of information that will verify it. These documents were stuffed into the pages of the original owners manual and documentation. I got it all in a box with the spare parts that came with the console sale. I found that pretty amazing. I can't tell you if anything really great was recorded on this console originally. I wouldn't be surprised if there was a John Lennon, Mariah Carey, or Quincy Jones project, or other really cool project like that recorded on it. I would love to hear from anyone on this forum who may know about a Mozart that was installed in the Hit Factory around those years. Maybe Colin can chime in here and see if my serial number matches this information as the original owner, to verify this? Man the console looks amazing! We also have a Mozart and have just finished the Re-cap of the entire board. We've been using it solidly for the last 15 years and see no reason to change to anything else. Your posts have inspired us to get it looking as good as it sounds! One thing, we're dead set on getting happening is the Automation. We got pretty close about 5 years ago and abandoned the project, but Im dedicated! I know you have posted that you haven't set that up. But any info would be great and I'd love, if you have the time, to back and forth about the console in general. Your board looks great and its been a real buzz to see it come to life. Super Cool! THanks for all the photos and details. looks fantastic! …. glad to hear it sounds good….as expected! I just stumbled across this thread and I am indeed very inspired. 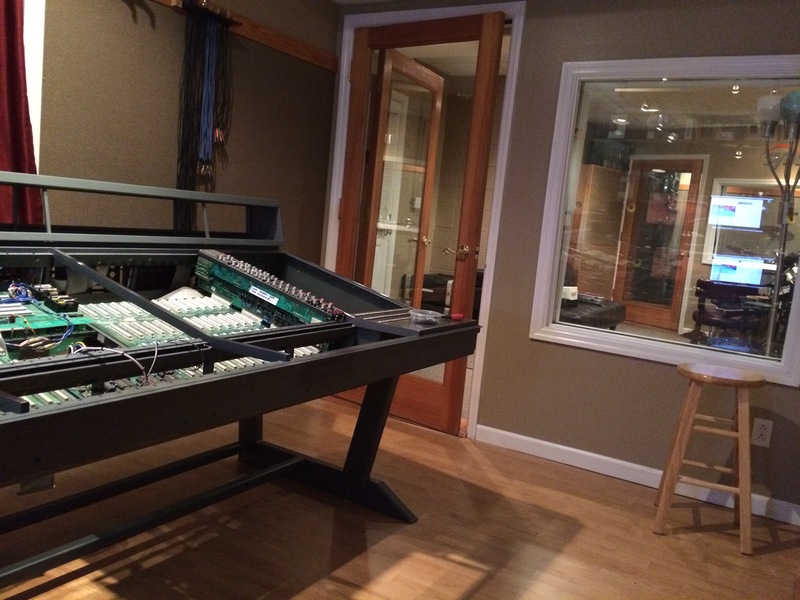 I own an almost identical Mozart console. It's from 1989 has 32 langley and 8 RN strips. I also think these are really great consoles. I am also in Melbourne, Australia. I've has this console for about 6 years now.I am the 3rd owner. It had also been somewhat neglected at its previous studio, so it took a bit of work to get it going. 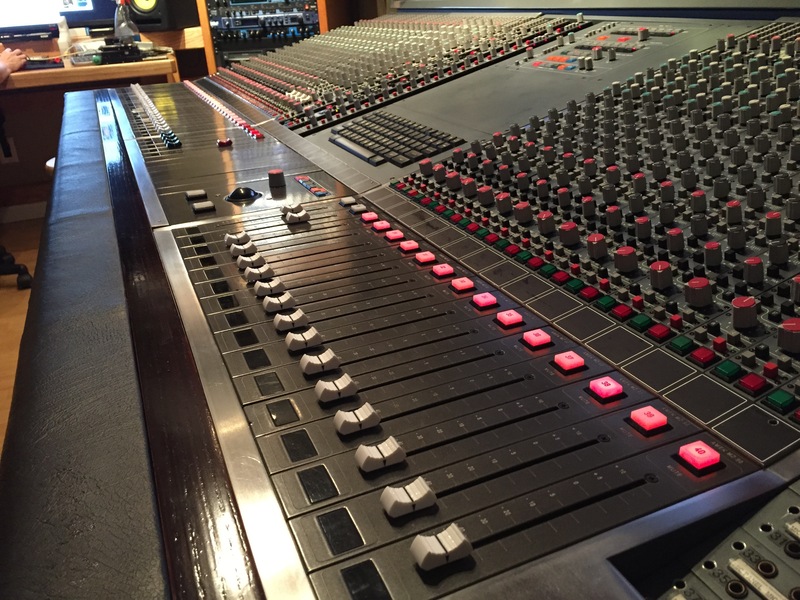 Also at its original owners studio (Sing Sing, probably Melbournes best studio) they were at one point earthing all of the outboard equipment and monitor amps via the patchbay to "fix" an earthloop. This caused the patchbay to one day spontaneously bust into flames. 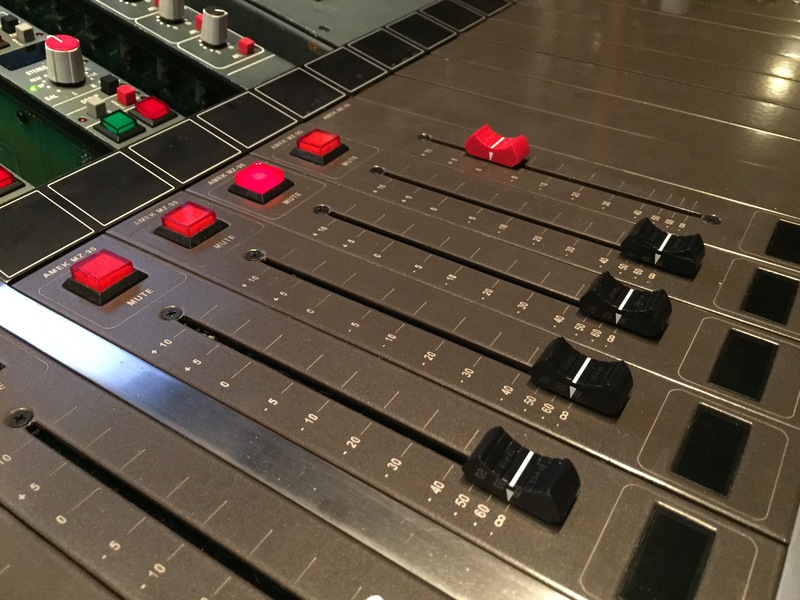 Also evidence of a large black coffee having been poured inside the faders on the right hand side of the master section. I basically did a thorough clean of all pots and switches mostly with caig faderlube, installed a replacement grouping computer strip, rebuilt the power supply, some other bits and pieces. Overall I am quite happy with the sound but I know it could do better with all the mods, recapping etc. I have not as yet had time but I intend to, very soon do many of the improvements you have detailed here. I would love to pick your brain, if you have the time and inclination to share with me a few more of the finer details. I must first re-read several times what you have posted so far as i must admit I have just skimmed it mostly, as it's currently 4am here. 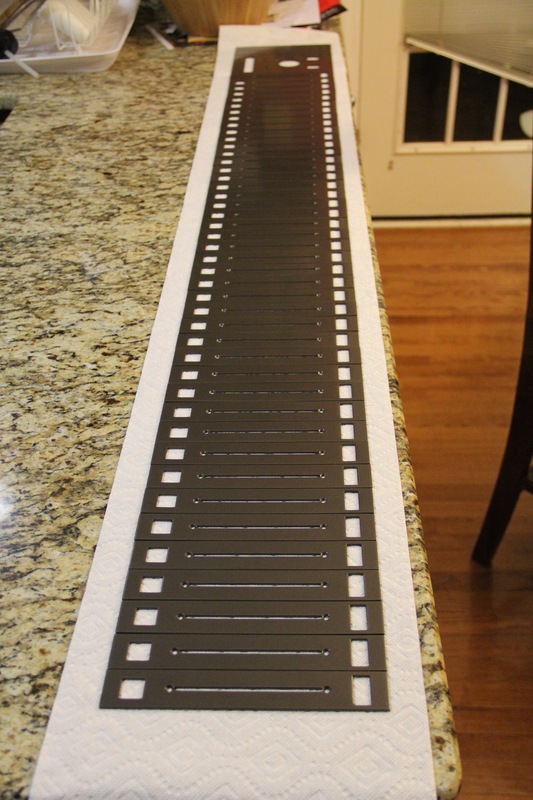 I would definitely love to get a copy of the fader plate art work as many of my channels have faded almost completely and I was wondering what I would do about it. I think the laser engraving is a great idea! PM sent to roadbear re: graphics file for Mozart fader panels. Thanks for the kind words. I would be glad to share with you guys anything that I have learned while doing this project. Let's all communicate via this thread. 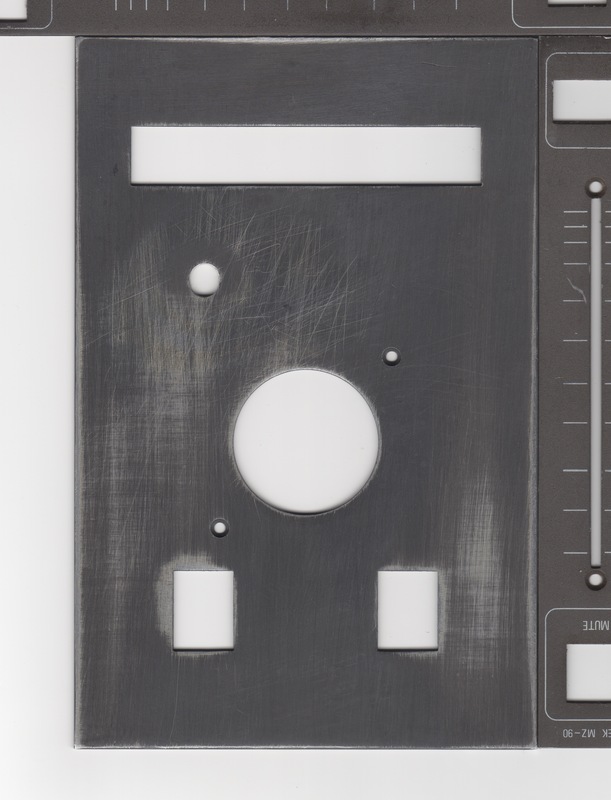 Here is a link to the fader plate Artwork that was created for this Amek Mozart project. This .ZIP contains all of the files I prepared while setting up for screen printing and laser etching for the fader plates. Note, it also contains the trackball plate. My trackball plate was "customized" with the SSL style monitor knob on it. The drill hole for that pot may not be the same as other Mozarts. 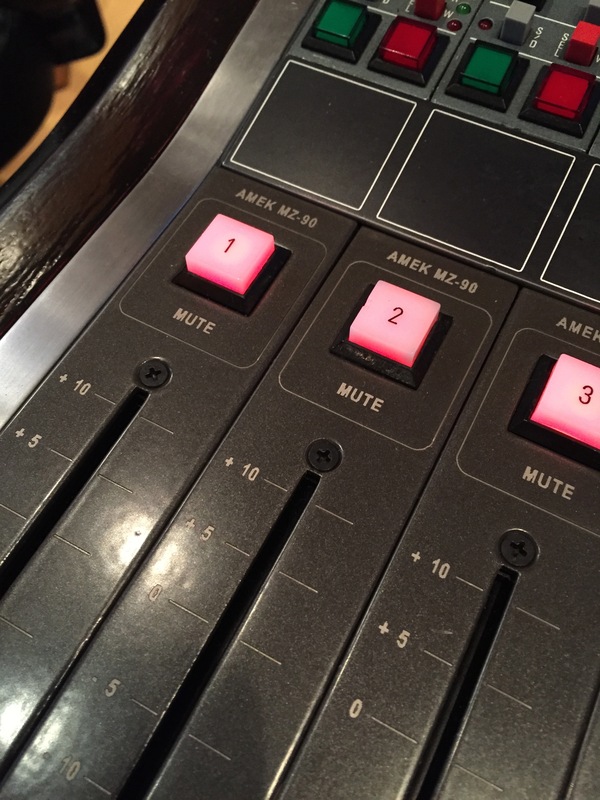 Fader plates should all be the same.